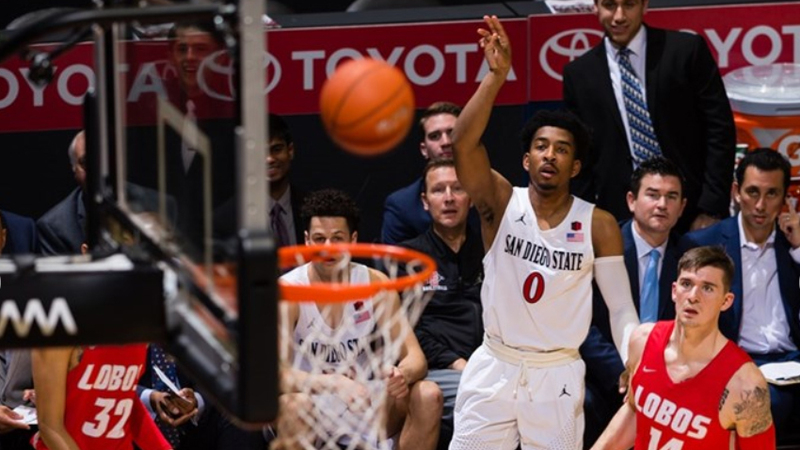 Once again needing a good, solid win after a tough loss, San Diego State sent New Mexico packing with a 97-77 win Tuesday at Viejas Arena. The Aztecs (12-7, 2-2 Mountain West), for the first time since February 2015, started four underclassmen and the underclassmen showed promise. Redshirt sophomore Jalen McDaniels had a double-double with 24 points and 11 rebounds while freshmen Nathan Mensah had 16 and Aguek Arop had 10, including a 65-foot buzzer beater at halftime. Arop stole the ball with six seconds left on the clock, took two steps and launched a three-quarter-court length jumper that went through the net at the buzzer, giving the Aztecs a 44-39 halftime lead. San Diego State was helped by the continued use of zone defense by New Mexico (8-9, 2-3) for the entire game. The Lobos’ 1-3-1 defense gave McDaniels plenty of opportunities. He made 10 of his 19 shots. The trick now is to get the team to play that way in one-on-one offense, he said. Up next, the Aztecs travel Fresno to face off Fresno State. They will face a familiar face. Justin Hutson, the Bulldogs’ first-year coach, was a longtime assistant at SDSU.